Ikpeze, C. (2007). Small Group Collaboration in Peer-Led Electronic Discourse: An Analysis of Group Dynamics and Interactions Involving Preservice and Inservice Teachers. 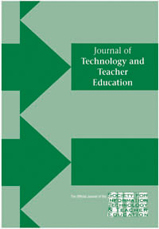 Journal of Technology and Teacher Education, 15 (3), 383-407. Waynesville, NC USA: Society for Information Technology & Teacher Education. Retrieved April 19, 2019 from https://www.learntechlib.org/primary/p/21043/.